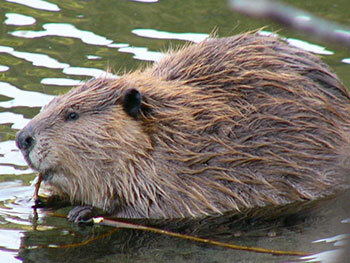 The beaver, Castor canadensis, is the largest rodent in North America. Beaver are industrious engineers that prefer certain woody species of vegetation for food and construction of their dam lodges, which they use for shelter and food storage. Use of woody species for food and shelter modifies streams and surrounding woodlands. Modification often improves the health of crucial life-giving riparian areas. By damming rivers, beaver create still water ponds which increase the amount of water in a given area by allowing water to filter into the ground, thus, raising the water table, recharging aquifers, and improving water quality downstream. Dams can help rehabilitate areas where vegetation has been damaged, while also improving habitat for fish, amphibians, invertebrates, birds, and large land mammals. Beaver also provide a valuable fur resource for humans. Aside from the benefits beaver provide to the ecosystem, they can also be a detriment to humans coexisting in the same habitat. Dam building can damage nearby lands by causing flooding, tree cutting, bank burrowing, and crop destruction. In Alaska, beaver are moving further north as habitat changes and access to woody plants increases. Complaints in Alaska generally relate to flooding during spring break-up, increasing giardia in the water supply, and decreasing access to traditional subsistence fishing areas by changing water flow characteristics of streams. For general information on beaver (PDF 38 kB), visit the Wildlife Notebook Series. Living in Harmony . . . Most of the time, beavers and humans live in harmony. Beavers create wetland habitat for other wildlife like birds, fish, insects, amphibians and other mammals. 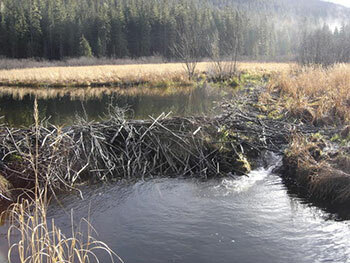 Beaver dams help reduce erosion and sedimentation in rivers and streams. Beavers provide a valuable fur resource. Beaver ponds create diverse aquatic ecosystems. Beavers can provide valuable habitat for endangered animals and plants. Beavers can provide natural irrigation ponds. Living in Conflict . . .
Beaver dams can cause flooding of crops and roads. Beavers can spread disease, for example, giardia in drinking water. 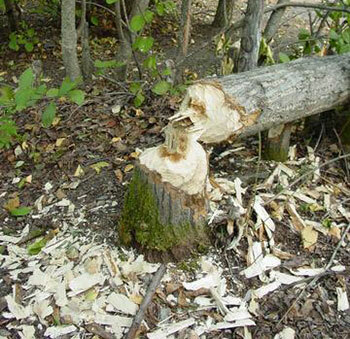 Beavers can cause damage to forests and landscaping. Beavers can dam irrigation canals preventing water from flowing to farmland. Beavers can undermine dams and roads built by humans. Beavers can cause problems for some endangered plants and animals. Installing fences and barriers around culverts, drains, structures and trees to keep beavers away. Painting trees with a sand and paint mixture that discourages beavers from chewing the trees. Using electric fencing to discourage beavers from staying in an area. Using electric shock in the pond to repel the beaver. Removing small trees and woody vegetation that beavers eat to make a place undesirable to them. Removing their dams may encourage beavers to move elsewhere. Installing a beaver pond leveler, three-log drain, or other device to maintain desired water level. Capturing and relocating the beavers. Shooting or trapping the beavers. Animal Protection of New Mexico and New Mexico Department of Fish and Game. April, 2008. Living with Beavers: A Guide for Solving Beaver-Human Conflicts. USDA Wildlife Services, US Department of Agriculture, Animal and plant Health Inspection Service. Living with Wildlife: Beaver. Woodford Riley, editor. 2008. Alaska Wildlife Notebook Series: Beaver. Alaska Department of Fish and Game. Juneau, Alaska.